So, school has begun. I’m on top of things so far, but starting school every year requires quite the transition — from having loads of time to all the sudden having to fight for time to read. I love my job and won’t complain, but the transitions are my least favorite aspect of it. This semester feels different to me, though, since I know I won’t be returning to teach in the spring. I normally have an image in my mind of the teaching year running from September to May, but now it’s only September to December, and then … everything changes, as people keep telling me. Michael Holroyd’s A Book of Secrets: Illegitimate Daughters, Absent Fathers. The kind of nontraditional biography I like. Vera Brittain’s Testament of Youth, a book discussed by a number of bloggers, but most especially Rohan. Edmund White’s A Boy’s Own Story, to add to my memoir collection. Frank Baker’s Miss Hargreaves, for when I’m in the mood for something lighter, possibly post-childbirth. Willa Cather’s O Pioneers, for when I’m in the mood for another classic-type book. Theodor Fontane’s Effi Briest, ditto, or I should say, for when I’m in the mood for a classic in translation. Eugen Herrigel, Zen in the Art of Archery, for when I want something more philosophical. As for reading, last week I finished Kate Zambreno’s novel Green Girl, and liked it a lot. I heard about it through the Tournament of Books where it got eliminated immediately (by The Marriage Plot, which got so, so, so much more attention, but which wasn’t as intriguing as Green Girl was). Apparently a lot of readers found the main character, Ruth, unlikeable. She IS unlikeable, in some ways at least, although I found myself getting fond of her and certainly sympathizing with her, but that unlikeableness is part of the point. She’s a young American living in London, trying to scrape by on low-paying jobs. She’s isolated and bored and unhappy. She doesn’t have what I can only think of as internal resources to get her through — she’s not interested in much beyond pop culture and fashion, movies and boys and parties. She doesn’t know much about the world and doesn’t know how to reach for anything more meaningful, or even that anything more meaningful exists. She’s a depressed and depressing creation of modern media, consuming as much as she can but never finding any satisfaction in it. She’s full of surface-level images of what girls should be and she does her best to live up to these images while finding the entire enterprise horribly empty. It’s the critique of fashion, celebrity, party-girl culture that I liked. There is a sense, if only a vague one, that Ruth will eventually move on and grow up, but for right now, she’s trapped. There is also an interesting narrator who in the beginning of the book self-consciously conjures Ruth up and then continues to comment directly on her throughout — a commentary that is both critical and sympathetic and is a pretty good guide for figuring out what to make of the character. I’ve been reading Zambreno’s blog for a while now and am looking forward to reading her new nonfiction book Heroines. She is a writer I plan to follow. Then I started Zadie Smith’s new novel NW, which I was lucky to be able to get quickly from the library. I haven’t finished it yet — I’m about 70 pages from the end and hope to finish it today — so I won’t write much about it now. But so far I’m enjoying it. Having a lean, tight structure is not exactly Smith’s thing — the book feels a bit all over the place — but it’s never been my thing either, and I like the book’s different sections with different writing styles. I’m liking the characters and the way Smith conjures up a particular part of London. More on that one soon (hopefully). Finally, here is another pregnancy picture. I’m going to give you the 19-week one instead of the 20-week, which I wasn’t happy with. I’m past halfway now! Eat the Document, by Dana Spiotta. I liked her recent novel Stone Arabia very much and so want to read more. The Mystery Guest, by Gregoire Bouillier. Did Litlove recommend this one at some point? I think so… anyway, it’s been on my list of books to check out for a while. Black Swan Green, by David Mitchell. Cloud Atlas was great, and he seems like such an interesting writer. Running with Scissors: A Memoir, by Augusten Burroughs. I’ve read enough memoirs and have read enough about memoirs, that it makes sense to me to collect some of the major ones, and this one seems important. Borrowed Finery: A Memoir, by Paula Fox. See above. Death in the Garden, by Elizabeth Ironside. I know nothing about this book or this author, but it’s published by Felony and Mayhem Press, which is an awesome name, and it looks appealing. In the Land of Pain, by Alphonse Daudet. I think I heard about this from David Shields, of Reality Hunger fame. It’s translated by Julian Barnes. It looks like the kind of nonfiction I like. As for reading, I had less time than in previous weeks because school is starting to get back into gear. My classes start on Tuesday, but last week I had meetings and advising to keep me busier than usual. With the reading time I had available, I finished Kate Atkinson’s Behind the Scenes in the Museum. I liked it. I was hoping to love it, which I didn’t exactly, but still, it was good. I had thought it had something to do with museums, which it doesn’t, at least not in a direct sense: it’s about a family and the changes it goes through throughout the 20th century, so the idea seems to be that the novel is showing the real-life, ordinary events behind the “museum” of history. It has a first-person narrator who tells her life story, and in between each chapter are footnotes to the main narrative that are flashbacks to earlier generations and their stories, all of which are shaped by larger historical events, usually wars. I liked the main narrator, and her sections are the most enjoyable. I also liked the family Atkinson created. It’s kind of a messed-up family, with a lot of stories of unfulfilled dreams, disappointment, unhappy marriages, and unwanted children. But she shows how each person got where they did and creates sympathy for them and their struggles. The title phrase “behind the scenes” also captures the importance of family secrets; there is a lot that the younger generations don’t know about the older ones, or that they only slowly find out about them. There are also many stories that are captured by objects, seemingly unimportant ones that turn out to carry greater weight than the younger generations realize. I did think the book got a little long towards the end, but overall, Atkinson manages her large cast of characters and her complicated story very well. In other news, I bought maternity pants this past week. Fortunately, I have a friend who is willing and eager to go shopping with me, and she helped me navigate the shops and find some decent things. As of now, I have two pairs of stretchy running shorts I can wear, two pairs of yoga pants I can wear, and now two pairs of maternity pants, which I will do my teaching in. 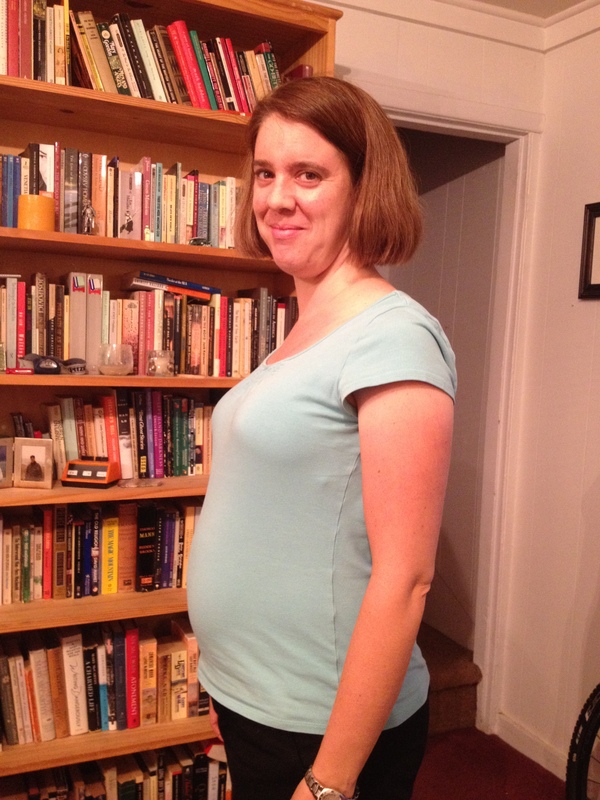 Eventually probably the shorts and yoga pants will get too tight, and then I’ll … live in my two pairs of maternity pants? Not sure. I’m such a terrible shopper. Fortunately again, this same friend is going to help Hobgoblin and me figure out what baby equipment we want to register for, and I’m so grateful for the help, because the world of baby equipment is bewildering. I’m so happy to be pregnant, but, my goodness, there is just so much involved.